Current members in good standing may purchase display advertising space in the 2019 OCAPA Buyer's Guide. New issue available May 2019. We can now help you significantly reduce the cost of providing employee benefits. Our benefits program includes health plan options for our members with an Oregon CCB or Washington Contractors license, as well as certain mining trades. As an OCAPA member, you have access to special negotiated pricing & underwriting requirements from two carrier options: Kaiser Permanente & Samaritan Health. The program also includes a time saving administrative services feature. This can help save you staff time and expenses, and allow you to provide a more complete benefit package to your employees. NOTE: Various voluntary benefit options, including dental plans, are available to all OCAPA members. Please click the link above to inquire. Nationwide Services - Save 2-5 cents on every gallon pumped. 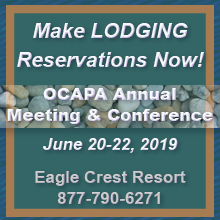 Qualifying OCAPA members may receive a group discount on their workers’ compensation rates. Questions? Contact Pat Morrill at SAIF or visit their website to learn about SAIF and OCAPA’s group program. September 12, 2018: SAIF announces two policyholder dividends will be paid out in October 2018.